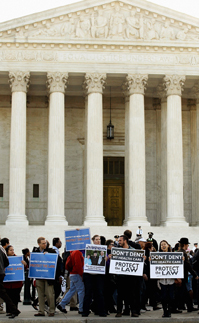 Has Chief Justice Roberts led an activist court? The Supreme Court opens a new term on Oct. 1 with a major affirmative action case from the University of Texas set for argument the next week. Chief Justice John G. Roberts Jr. is starting his eighth year on a court that is divided on many issues between five generally conservative Republican appointees and four liberal Democratic appointees. Court watchers are still debating the implications of Roberts' surprising vote in late June to join the liberal bloc in upholding President Obama's controversial health care law. Despite that decision, liberal critics continue to accuse the Roberts Court of political decision making, judicial activism and a pro-business orientation. The court's defenders say the justices are acting without regard to politics and following judicial restraint. Besides the affirmative action case, the justices may also tackle marriage equality and voting rights cases before the term ends next June.